It is now just 100 days until COP21 in Paris. The summer months have seen many Intended Nationally Determined Contributions (INDCs) submitted to the UNFCCC prior to the assessment deadline of October 1st. This is the date when the UNFCCC secretariat will start work on a synthesis report on the aggregate effect of the INDCs as communicated by Parties. 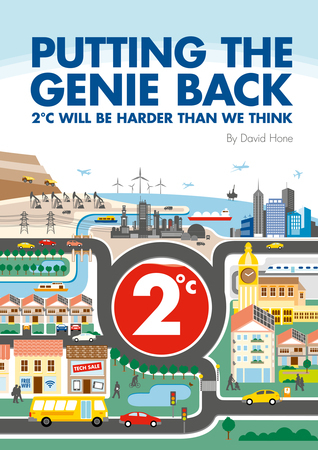 Many organisations are already offering assessments of progress, with most basing this on reductions through to 2030 against a notional 2°C pathway. However, the climate system doesn’t care about 2030 nor does it respond to changes in annual emissions. The real metric is cumulative emissions over time, with each trillion tonnes of carbon released into the atmosphere equivalent to about 2°C rise in temperature rise (this isn’t precisely linear, but it is a reasonable rule of thumb to use). This means that any assessment must look well beyond 2030 and make some bold assumptions as to where the emissions pathways then go. 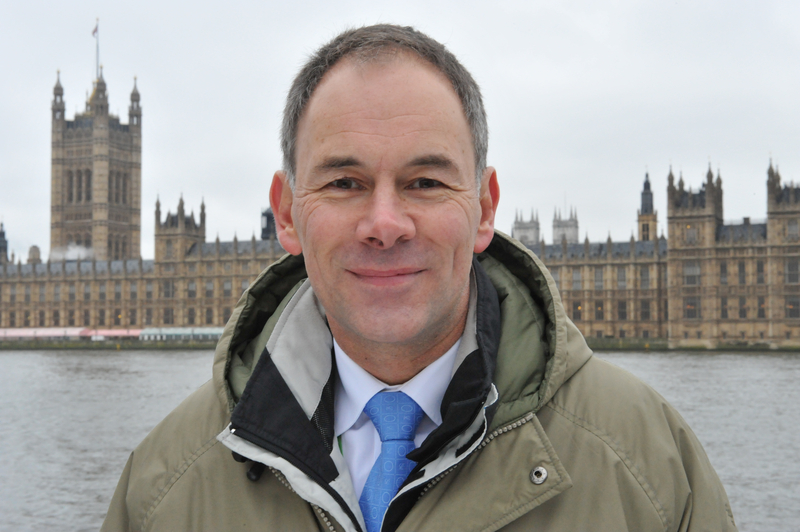 It also means that the wide variety of pledges using metrics such as the share of renewable energy in the power generation mix, installed solar capacity or emissions per GDP, whilst important in the context of energy system development, offer limited insight into the trend for cumulative emissions. From an energy emissions context, only the first part of this pledge is really important, but little information is given allowing an assessment of its real impact on the climate system. Some big assumnptions will have to be made. The USA and China appear to have adopted a “Contraction and Convergence” approach, with a goal of around 10 tonnes CO2 per capita for 2030, at least for energy related emissions. For China this means emissions of some 14.5 billion tpa in 2030, compared with the latest IEA number for 2012 of 8.3 billion tonnes, so a 75% increase over 2012 or 166% increase over 2005. It also has China peaking at a level of per capita CO2 emissions similar to Europe when it was more industrial, rather than ramping up to the current level of say, the USA or Australia (both ~16 tonnes). By comparison, Korea currently has energy CO2/capita emissions of ~12 tonnes, so China peaking at 10 is some 17% below that. A plateau for about a decade, followed by a long slow reduction through to near zero by 2100 means cumulative emissions from 2015 are around 800 billion tonnes of CO2, or 220 billion tonnes of carbon. In this scenario, Chinese emissions alone take the global carbon emissions total to 820 billion tonnes. A sharp decline from 2030 to zero before 2080 gives cumulative emissions of 550 billion tonnes, or 150 billion tonnes carbon. In this case the global total rises to 750 billion tonnes carbon based on Chinese emissions alone. 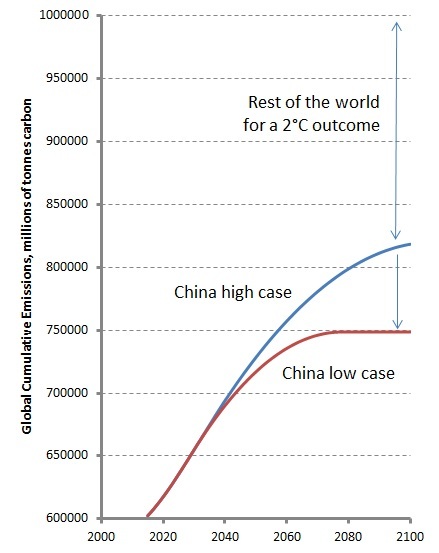 Either way, China will have a profound impact on global cumulative emissions. But this fairly simple analysis illustrates that the period from 2030 onwards is where the real story lies, which to date isn’t covered by any of the INDC submissions. For a 2°C outcome, even the lower of the two scenarios above leaves little carbon space for the remaining 7+ billion people living on the planet throughout the 21st century. Will the Clean Power Plan deliver effective emission reductions? Do we have a wicked problem to deal with?